CARLSBAD, Calif. (AP) -- Top-seeded Kim Clijsters struggled to advance to the quarterfinals in the Acura Classic on Thursday, beating Jelena Jankovic 6-4, 3-6, 6-3. Clijsters extended her winning streak to 22 matches in North American summer hardcourt tournaments since she lost here last year in the quarterfinals. Clijsters has won 42 of her last 44 matches in all North American hardcourt events. Jankovic played well, but lost to Clijsters for the second consecutive week in the third round. The Serb dropped a 5-7, 6-2, 6-2 decision last week in the Bank of the West Classic as Clijsters went on to win the tournament in Stanford. Clijsters will face eighth-seeded Martina Hingis of Switzerland, a 6-2, 3-6, 6-1 winner over Flavia Pennetta, in Friday's quarterfinals. Hingis, the former No. 1-ranked player, appeared in control when she closed out the first set in just 27 minutes. But Pennetta came back from a 3-1 second-set deficit to win the final five games and force a third set. Hingis, the winner of five Grand Slam titles, allowed Pannetta just four points as she took a 5-0 lead en route to victory. Second-seeded Maria Sharapova beat fellow Russian Vera Zvonareva 6-4, 6-4 in another third-round match. Sharapova, ranked No. 4 and the 2004 Wimbledon champ, upped her career record to 3-2 against Zvonareva. "From the beginning of the match, I felt like I hung in there and was really patient," Sharapova said. "I felt like I played really solid." Sharapova's quarterfinal opponent will be defending champion Mary Pierce of France, a 6-2, 6-1 winner over Emma Laine of Finland. In other matches, fourth-seeded Elena Dementieva of Russia beat India's Sania Mirza 6-2, 3-6, 6-3, No. 5 seed Patty Schnyder of Switzerland advanced with a 6-3, 3-6, 6-1 win over Argentina's Paola Suarez, and seventh-seeded Nicole Vaidisova of the Czech Republic was a 6-4, 6-2 winner over Daniela Hantuchova of Slovenia. Ana Ivanovic of Serbia and Montenegro, the No. 14 seed, lost to Russia's Anna Chakvetadze, 4-6, 6-4, 6-1. The start of play was delayed at the La Costa Resort & Spa for three hours due to wet courts that were caused by a heavy morning mist. 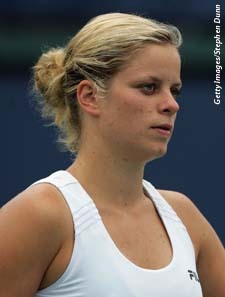 Clijsters did not look like the second-ranked player in the world. "I was just trying to hang in there," Clijsters said. "My legs felt dead today. I felt like it was so hard to keep pushing myself, but I tried." Clijsters won the first set on the strength of a service break in the seventh game for a 4-3 lead. But Jankovic came right back and matched the Belgian stroke for stroke, breaking Clijsters' serve in three consecutive games for a 5-1 lead. The pair were on serve in the final set before Clijsters finally broke Jankovic's serve in the sixth game to take a 4-2 lead after blowing three break points. "In the third set, it's a little bit of a mind game," Clijsters said. "That's always going to have a little bit of an influence on both the person who wins and loses the game. That's something that makes a difference." Jankovic's game seem to sag from that point forward as Clijsters served out at love and closed out the match by smashing a forehand winner. Clijsters began her North American summer hardcourts string with consecutive titles last season at Los Angeles, Toronto and the U.S. Open. She added to the streak with Sunday's win at Stanford.